← Does it glorify God and are you doing it NOW? 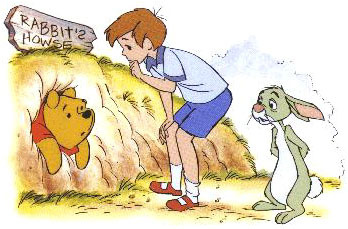 Silly ‘ol bear – that’s me today – stuck, as it were, on a bunny trail. This image came to mind as I began to post my reflections on the readings today. Stuck, as a new season dawns and wondering if the whisper is to stay here, stuck – hibernating and going silent. As we approach Advent, I am going to try a new thing on this blog – a new season of reflection. Instead of sharing personal whispers and tableaus, I am going to post those verses from the lectionary readings that prompt me to pause, averting or even closing my eyes – those words that I sometimes choose to follow on a bunny trail until stopped by an aha moment breath wherein I hear what the Spirit is saying to God’s people. 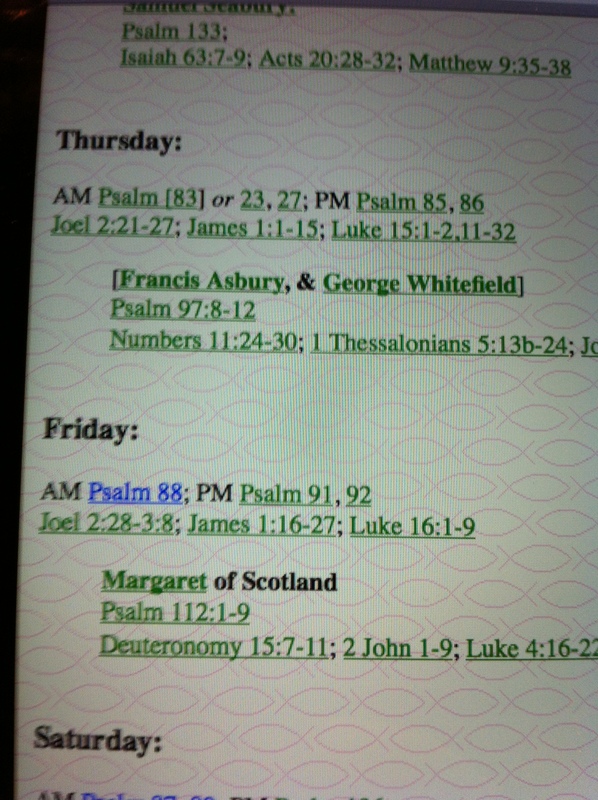 I will begin the posts with the Daily Office (Lectionary) readings. The link I provide here is to an online resource for the Episcopal Church, but the readings are read by anyone following a liturgical calendar. The cycle’s purpose is to cover all the bases in Scripture in Sunday worship; the Psalter, Old Testament, Gospel and Epistles; over a three year period by which nearly all of the bible is read, presuming worship attendance every Sunday. The intervening weekday readings as outlined in this link follow the liturgical calendar set out by the three year cycle, generally. The photo to the left of my computer screen is what you will see when you link to the lectionary site and scroll to the middle of the page. Note that two more weeks of the season of Pentecost until the church liturgical calendar moves to Advent. 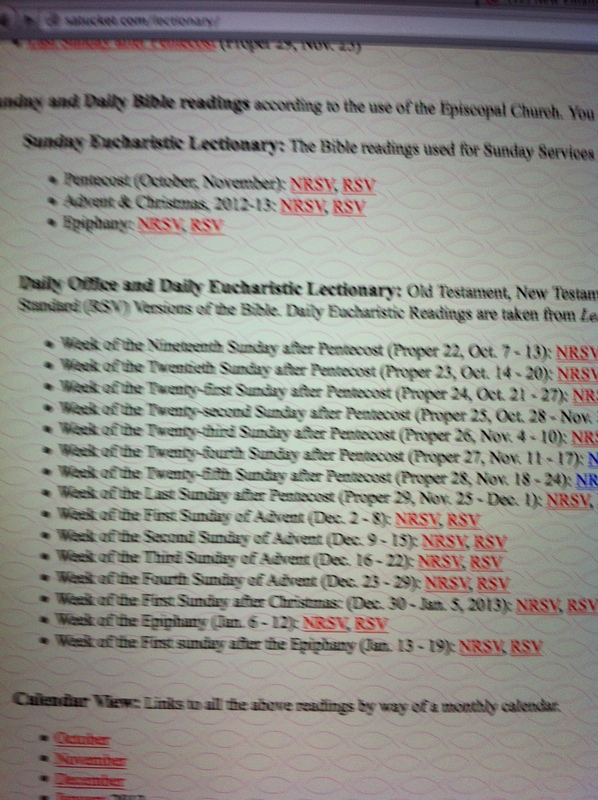 Depending on what version of the Bible you read, simply click on NSRV (New Revised Standard Version) or RSV (Revised Standard Version) and you will be lead to a page with the readings day by day, which looks like this second image from my computer screen. Ok. I think that’s enough ‘how to.’ So to recap – for however long the Spirit intends, I will be posting the lectionary readings for the day, and those passages from the readings that for one reason or another cause me to pause, and though a written reflection may be suggested, I am going to do that privately for awhile. I would be blessed by any of your reflections or comments. A season of listening is what the Spirit has in mind for me right now and the wondering that often follows from lending my earnest heart and ear, is going into a hibernation of sorts. I’ve always talked too much, anyway. The next post will follow the format as I’ve laid out. Blessings and thank-you for stopping by. This entry was posted in Whispers and tagged Holy Spirit, lectionary readings, pause button, scripture. Bookmark the permalink.